Like any city, Seoul goes through seemingly random food trends and fads. Once such a trend hits, you’re bound to see the same food or dish almost everywhere from street food carts to even high end restaurants sometimes. One such trend that has arrived in Seoul recently is a type of German cookie/pastry called schneeball. From what I’ve read online, this cookie is traditionally made by taking rolled out shortcrust dough and cutting out strips which are then arranged over a stick into the shape of a ball and then deep fried, dusted with confectioner’s sugar or coated with other toppings. I first began seeing these curious shaped ball cookies on the streets of Myeongdong where these strange ball-like cookies were being sold from street cart vendors. They didn’t resemble anything Korean and I presumed somewhere some bakery had made this a hit and had sparked the inevitable copycats on the streets. My assumptions proved correct as I found out a company called Schneeballen Korean has aggressively been ramping up their presence with their own stores and department store corners. A friend, on her way from stopping by a shop in a department store, surprised me with a pack one day where we sampled the cookies together. I’m not much of a sweets guy in general so I might have ended up buying one one day out of sheer curiosity but I would’ve never bought myself such a large pack O_O In any case, I was able to sample five different flavors from this company. Though originally schneeballe comes dusted with sugar, at these Korean stores you can get an assortment of different flavors including some curious ones involving garlic or onion. The first one I opened up was a brightly yellow colored banana flavored cookie. Each ball was big enough to fit in one’s hand. The banana flavored one came dusted in bright yellow banana powder. Though I didn’t have the traditional wooden mallet on hand, I took out my regular hammer and, after wrapping up the schneeball, gave it a few good whacks. Cracking it open, I could see the layer of icing that had been drizzled over the cookie before receiving its banana powder dusting. The cookie was crunchy, slightly harder and denser than a tortilla chip. The icing provided the sweet kick while the banana powder brought out flavors reminiscent of the popular banana milk around Korea. And finally a coconut flakes one. After sampling a few of the cookies I was very unimpressed with them. The various flavorings and coatings all taste quite a bit artificial with tastes similar to artificial strawberry milk, artificial banana, etc. Given the gourmet packaging and such, I expected a more luxurious taste would naturally follow but they were the sort of taste and flavors one can easily get from the cookies and other baked treats from your local convenience store. Now, I can’t say my assessment of schneeballes in general from Schneeballen Korea is the real deal since I haven’t had an authentic one from Germany or anywhere else outside of Korea. Once I perused the Schneeballen Korea site, I found the brand is one that is under a “Sand and Food” company which is a Korean corporation. In addition to the Schneeballen Korea brand, it manages a line of cinnamon buns and cafes too. It seems we have yet another case of a Korean corporation looking to make a new big food trend by taking in a food from abroad, Korean-izing it, packaging it nicely, getting some stars to advertise it (in Schneeballen Korea’s case, Tiger JK and Yoon Mirae) and including fancy words appealing to Koreans (“European Style Bakery” for example). 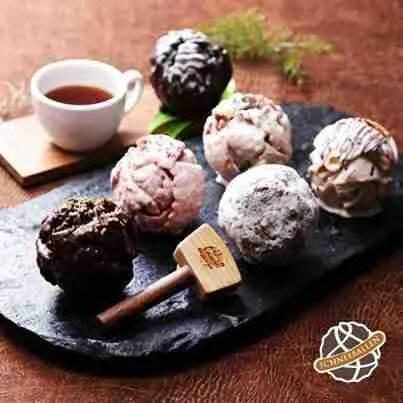 The fact Schneeballen Korea is also trying to market it as a high end product is evident to me as they are aggressively opening corners within high end department stores and also doing a number of promotions with hotels. The brand has begun capitalizing on current food trends by even offering its own take of the popular cronuts and has also begun expanding into the Japanese market. I was passing by a Schneeballen Korea store in Hongdae the other day and saw each cookie being sold for over 4,000 won! They’re even looking to profit off the wooden mallets! For that price and for what these cookies essentially are (fried bits of dough rolled in cheap flavorings) this sort of price is definitely not justified. I’d understand the price if the toppings were more luxurious (real pistachio bits or real dark chocolate, etc) or even as far fetched as them bringing in some master baker who churned these out from a bakery… but sorry Schneeballen Korea, you’re not getting another won from me. Stew is a Korean-American living and working in Seoul, Korea after having lived all his life in the US. He's passionate about all things food related and loves experimenting and trying out dishes in the kitchen when he has the opportunity. He has also started up a blog devoted to his gastronomical adventures which you can follow at http://www.whatsstewin.blogspot.kr/ His dream one day is to host his own travel and cooking food show like the great Anthony Bourdain. I’ve seen these at the Hyundai Department Store here. Interesting concept with the hammer. Seems like they are trying to sell these as ‘experience’ gifts where more attention is given to the packaging and the ritual of gift giving. Park will think “Kim gave Lee these foreign luxury cookies. They must be expensive. And look how nice the packaging is. It look very prestige.” And even if they don’t taste as good as they should, given the packaging, who’s going to mention it to the others?